Welcome to our Press Room, your online resource for breaking news about allnurses, the largest online nursing community in the world! This innovative and highly respected website is for all nurses at every level and in every specialty, both on and off the job. Access the latest news releases, nursing industry and background information about our services, activities, events, and talented members and staff. allnurses offers access to nurses/experts in various nursing fields/specialties for information on nursing topics. This has proven to be an excellent resource for media as they are developing stories related to hot nursing topics and need to obtain information directly from nurses. 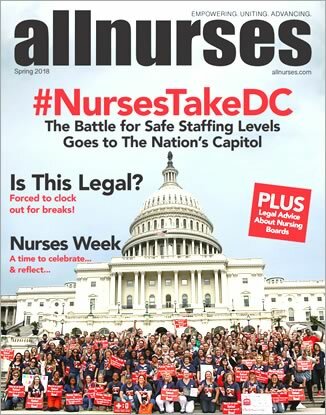 Are you a member of a media organization seeking to contact allnurses.com? Click here to get in touch with us! Nurse Watch: A How-To Guide on Seeking Your Next Nurse Job; What's Your 'Nursing Kryptonite'? Healthcare Workers and Ebola - How Safe Are You? It's National Nurses Week! Poll: Who's the Best TV Nurse?